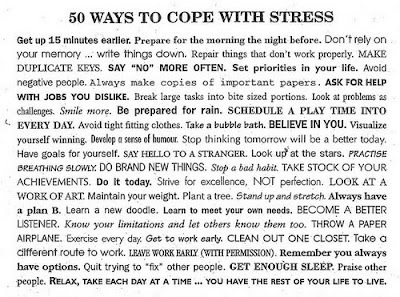 how to cope with stress. | escaped. how to cope with stress. Next week I have 4 finals coming up..explains why this blog is practically dead since last week. Hehe. I'm so not the right person to blog about this stress thing, because I'm a basket case every time I have finals. You can ask my boyfriend or my housemate about this, I can scare everyone away. He knows better not to mess with me during exam week. But it'd be nice if we can apply these in our daily basis. This should be my next year's new year resolutions. insyaAllah dimudahkan tujuan urusan perjlnn kite tuh.pastu bace dgn yakin sekali la.kalo time exm ade bende2 yg zatil hapal terlupe ke..bace selawat byk2. dulu xde la rase yakin sgt tau bace tuh.tp sejak gi umrah dulu selalu amalkan.alhamdullilah everytime bace,waktu solat dah msuk n terlambat gi masjidil haram pon still dpt smyg kat dlm masjid.pastu dpt tpt nak smyg dgn mudah walopon ade ramai manusia2 yg besar n kasar kat situ.